Turkish Prime Minister Ahmet Davutoğlu met Friday with Ahmed Mohamed, the Muslim boy who was arrested after a teacher mistook his homemade clock for a bomb in the U.S.
Davutoğlu welcomed 14 year-old Ahmed Mohamed in New York at an event organized by the Turken Foundation, which supports Turkish students studying in the U.S. Davutoğlu is in the city for UN meetings. Turken Foundation, established in 2014 in the United States by Turkey's two major foundations, Ensar Foundation (established in 1979) and TURGEV (established in 1996), assists eligible students by means of scholarship, accommodation and other cultural programs in order to improve their education process in the United States. The foundation also provides provides cultural, social and educational opportunities and experiences for the students, and helps promote cross-cultural relationships and understanding between various students' cultures and American culture and tradition. Ahmed's father, Mohamed Elhassan Mohamed, told Anadolu Agency the family was grateful for Turkey's support. "What happened to my son is something ridiculous," he said. "You accuse a Muslim because he is a Muslim. We need all this Islamophobia to stop." 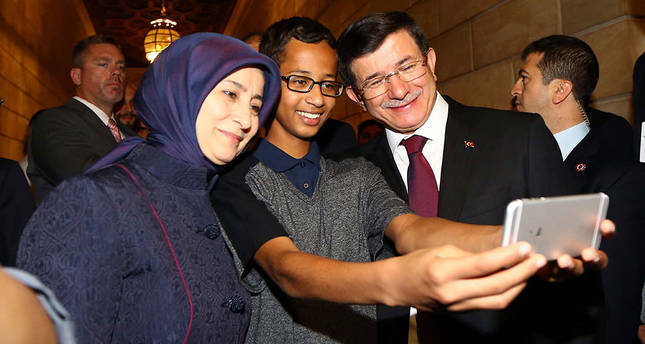 The student took a "selfie" with the Turkish prime minister and his wife Sare. After the meeting, Ahmed shared a selfie with the prime minister and his wife Sare on his Twitter profile with the caption, "Every Ahmed is great-Ahmet Davutoğlu it was an honor to meet prime minister and his wife". Ahmed, whose family are from Sudan, made international headlines when he was handcuffed, arrested and fingerprinted by police on September 16 after a homemade clock he brought to the school was mistaken for a bomb. The incident took place at a time when rising Islamophobia has exacerbated the debate around religious freedom in the U.S.
His arrest was widely criticized and the charges against him were eventually dropped. Ahmed received messages of support from a number of high-profile figures including President Barack Obama, who he visited at the White House.